Often the modern tailored look is quite thick and sculpted with a smooth rounded quality. However, here the crisp crease you’d expect to see down the front of tailored trousers was also applied to jackets, with vertical creases up through the torso or with horizontal ridges sitting low on the hips. When extra horizontal creases were added to trousers, they were used in such a way that it looked like a hem that had been let down at some point, never to be refinished. Aside from the tailoring in the collection, there were also some relaxed uses of pleats and ruffles styled in a loose way with raw hems and soft flowing fabrics. At times, pleats were used to splice evenly through drapey florals, but in other garments the pleating had more of a crumpled effect, echoing the crumpled leather tailoring. In these instances, the pleating was often worn knotted and bunched as scarfs and neckties. 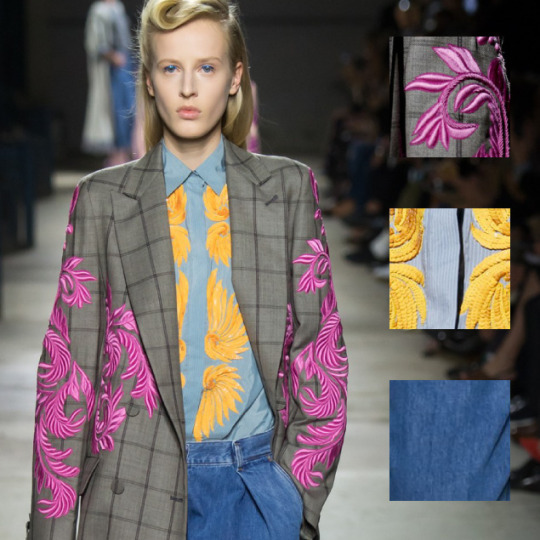 The piping details on some of the tailoring also seemed like a louche reference, taking the garments out of serious formal wear territory and putting them somewhere between smoking jackets and silky monogrammed pajamas. The piping finishes were also used on coats to define the edges of pockets and front edges. In contrast to the other less formal finishes, details such as the piping and tailored pockets were done immaculately, striking the balance or creating luxury garments, without making them feel overworked.